May 21, 2012 - The Federal Aviation Administration (FAA) has directed its investigators and staff to pursue stiffer penalties for individuals who purposefully point laser devices at aircraft. "Shining a laser at an airplane is not a laughing matter. It's dangerous for both pilots and passengers, and we will not tolerate it," said U.S. Transportation Secretary Ray LaHood. "We will pursue the toughest penalties against anyone caught putting the safety of the flying public at risk." 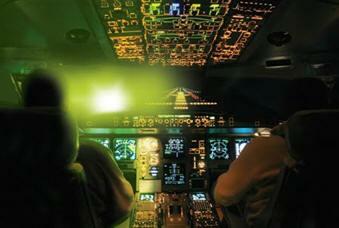 The number of reported laser incidents nationwide rose from 2,836 in 2010, to 3,592 in 2011. Laser incident reports have increased steadily since the FAA created a formal reporting system in 2005 to collect information from pilots. The FAA supports the Department of Justice in its efforts to seek stern punishment for anyone who intentionally points a laser device into the cockpit of an aircraft. "We will continue to fine people who do this, and we applaud our colleagues at the Justice Department who have aggressively prosecuted laser incidents under a new law that makes this a specific federal crime," said FAA Acting Administrator Michael Huerta. The FAA has initiated enforcement action against 28 people charged with aiming a laser device at an aircraft since June 2011, and this week the agency directed FAA investigators and attorneys to pursue the stiffest possible sanctions for deliberate violations. The FAA has opened investigations in dozens of additional cases. The FAA announced last June it would begin to impose civil penalties against individuals who point a laser device at an aircraft. The maximum penalty for one laser strike is $11,000, and the FAA has proposed civil penalties against individuals for multiple laser incidents, with $30,800 the highest penalty proposed to date. In many of these cases, pilots have reported temporary blindness or had to take evasive measures to avoid the intense laser light. The guidance for FAA investigators and attorneys indicates laser violations should not be addressed through warning notices or counseling. It also directs moderately high civil penalties for inadvertent violations, but maximum penalties for deliberate violations. Violators who are pilots or mechanics face revocation of their FAA certificates, as well as civil penalties. Local, state and federal prosecutors also have sentenced laser violators to jail time, community service, probation and additional financial penalties for court costs and restitution.